Summary: Unlike other breeds, pit bulls do not require an immense amount of maintenance and hygienic services. Pit bulls love to cuddle and play. Whether it’s outside in your backyard or around other dogs, they love to go wild and have a good time. With that being said, you’ll want to make sure that your active buddy stays clean and fresh. Now, fortunately, these dogs do not require frequent baths. Depending on what your pit bull’s lifestyle is like, you’re likely to bathe him less than other breeds. However, daily brushing does help keep his coat both healthy and clean. If you’re planning on purchasing some XXL pitbull puppies for sale, you should know how to maintain their coat to prevent any infections or uninvited guests. Typically, you’ll find yourself bathing a dog about once a month, but that tends to differ from breed to breed. There are a variety of factors like natural oil production, the length of their fur, shedding, and other similar aspects. The fur on a pit bull is short and thick, meaning you’re probably not going to have to bathe him as often as you would with another breed. The experts at Iron King Kennels can find you the perfect pit bull companion for you and your family. 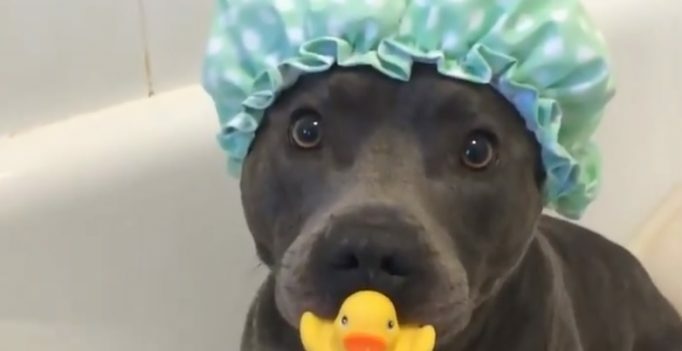 While you can bathe your pit bull as often as necessary, a pit bull needs one no more than once a month – and can even go as far as six months between baths. If your pit bull does start to scratch his fur repeatedly or looks uncomfortable while trying to relax, you’ll want to be make sure that he doesn’t have any fleas or bugs that are trapped in his fur. Now, because the pit has such short fur, it’s much easier for you to see and it’s also less attractive for bugs to try to build a home on your dog’s body. However, this doesn’t mean that you should neglect caring for him as he does need to be checked regularly so he can trot along happily.